1. Rub and pat crushed peppercorns on the steak. Heat oil in a heavy-based frying pan over high heat and pan-fry the steak for approximately 2 minutes per side (3 minutes if you prefer your steak well done). Remove steak onto serving plate and keep somewhere warm. 2. Heat butter over medium heat (in the same pan used for the steak). Stir-fry the mushrooms. When they begin to wilt (after a minute or two), pour in the cream (or milk, if dad is calorie-conscious). Season with a touch of salt and pepper. Take the pan off the heat as soon as the sauce boils. Pour immediately over the steak and serve. 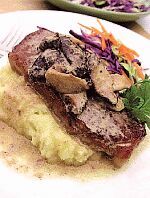 Mashed potatoes and a simple salad are good accompaniments to the steak.